After an 8 hour flight, we landed in Reykjavik, rented a car and headed east. 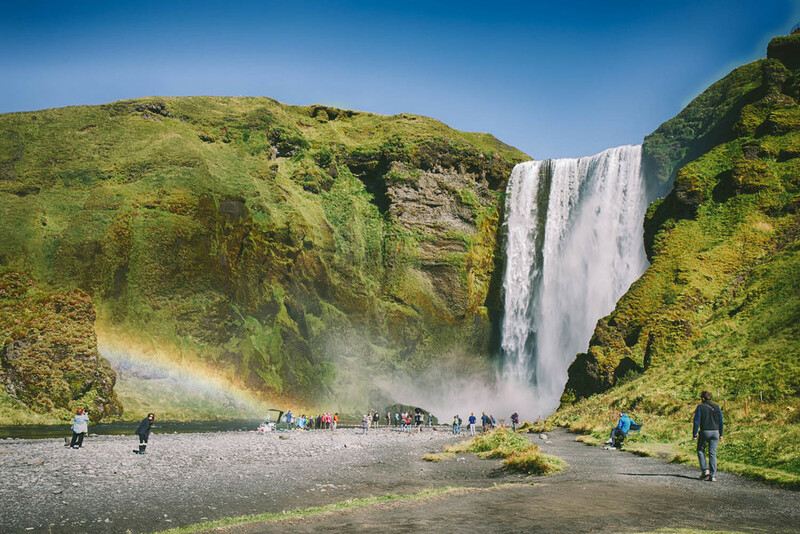 Our circumnavigation of the island began immediately, with a two hour drive and two epic waterfalls before we checked in to the Icelandair Hotel in Vík. When we arrived in Iceland, I was delirious from the travel (being a vegetarian is tough sometimes!). The only restaurants open when we got in were gas stations, and even then, my snacks didn't satiate my hungry appetite. However, when we made our first stop at Seljalandsfoss that all disappeared. Walking behind a beautiful waterfall filled me with so much excitement, my priority for eating completely went away. At our next stop, Skógafoss, I was so impressed by how close you can get to the waterfall. A double rainbow nearby didn't hurt either! By the time we set out for our hotel, my hunger pangs kicked in so we made a beeline to the closest restaurant in Vík, Halldorskaffi. We then reset - freshened up, took a long nap, had an early dinner at Berg Restaurant and continued our exploration of the town. After sunset, we returned back to our hotel with celebratory drinks at the bar for a successful first day of our 10-day journey.